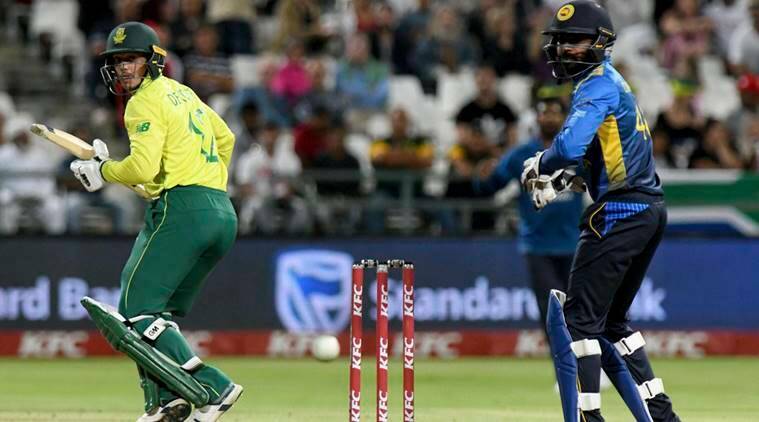 South Africa vs Sri Lanka 1st T20I Highlights: South Africa were restricted to 134/8 but Sri Lanka could not chase down the target of 15 in the Super Over. South Africa vs Sri Lanka 1st T20I Highlights: Sri Lanka incredibly restricted South Africa to 134/8 and the match thus went into Super Over. The visitors kept a lid on the scoring rate for much of the chase before David Miller turned it around for South Africa. However, Lasith Malinga and Isuru Udana pulled it back again in the last two overs and forced a tie. Miller and Rassie Van der Dussen came out for South Africa’s Super Over. Miller kept strike for most of it and squeezed 14 runs out of the over. Imran Tahir was the bowler and ensured that the danger man Thisara Perera got off strike off the first ball. Only four more runs were conceded in that over and South Africa won the match. He gave two full-throated roars in that Super Over and after that, he goes around talking to the Sri Lankan players. This has been an incredible match, Sri Lanka did so well to restrict South Africa to 134 in a chase that swung like a pendulum. But in the end, Tahir, that wily master of limited overs spin bowling, was too much for them to handle. Imran Tahir roars in delight as soon as he ensured that South Africa will need 12 from 1, bowls a wide and then a legitimate delivery to finish it An all-time T20I classic has come to an end in Cape Town. Two dots and a DROP! Fernando absolutely stumped by the variations and then Steyn dropped him. But 13 needed off 2 balls, and Tahir bowls a wide, 12 needed off two. Single off the first and Perera is off strike. Just before the first ball could be bowled, there seemed to be a little fire below the sight screen. Man this match is too hot to handle. Miller has done a good job here. He hits a four after the six was followed up with a dot ball. It seems De Kock will be behind the stumps this time and Imran Tahir should be bowling. No clue who Sri Lanka are sending though. Miller goes down on one knee and swings accross the line and it goes into the stands. Two singles, a third run was denied by Miller. David Miller and Rassie Van der Dussen take guard for South Africa, Lasith Malinga has the ball in his hand. Here we go! What a final over he bowled! It went 1, 0, 0, 1, W, 1. It was his over that Miller smashed 20 runs off to get South Africa back in the match but Malinga trusted his man and Udana has shown why he deserved that. What in the world? Tahir tries to cut a short ball, it takes a lower edge and goes to Dickwella, of course the Protas have gone for the run, Dickwella simply needed to roll it onto the stumps but he missed it! The batsmen complete the run and that means we will have a Super Over. A shot to deep midwicket, no chance for a double but they go for it anyway, Duminy is nowhere close to making his ground. Imran Tahir is already out there. South Africa need 2 to win off the last. Steyn finally connects and runs like the wind. No way they are even thinking about a second. 3 needed off 2. Oh you can cut the tension with a knife now. Duminy ran a single off he first ball and Steyn has since not been able to get bat on ball! This match is going down the wire, Malinga cleans up Rabada off the last ball of the 19th. Duminy on strike, South Africa need five to win off 6 balls, Udana to bowl the last over. Phehlukwayo with an absolutely needless slog over long on, ends up putting it straight down the throat of the fielder. This was turning out to be such a good over and he must be dissapointed with himself for that. Duminy and Phehlukwayo are taking the game away from SL again. Two fours and a single so far. OUT! Miller runs himself out! Well what do you know. Miller and Duminy go for two, the former is not quick enough and fielder with a gun of a thrown from the deep. Miller puts in the dive but can't make it. Van der Dussen gets a thick edge on a Malinga delivery and Sri Lanka break the partnership. Too little too late? Sri Lanka have been so good but within the matter of two overs, they have been blown away. Van der Dussen hits a six off the penultimate ball of the 16th and then takes four off the last. Partnership between these two now 65 off 38. 4, 0, 4, 4, 6, 2: 20 runs off the 15th over and Miller has turned it around for South Africa here. All of a sudden, the equation is just over a-run-a-ball. Sri Lanka have their tales up but South Africa have David Miller in the middle. As long as he is around, the hosts will have the upper hand. But this has been quite a performance from the Sri Lankans on the field. It's Du Plessis! Vandersay, the man with the bloody hand, bowls it full and outside off, Du Plessis ends up edging it to point. Sri Lanka are in the game or what! South Africa 57/3. It has taken them 9 overs to do so. Sri Lanka are making them suffer as much as they did while being in the middle. This match is on a knife's edge. Dananjaya gets de Kock! Sri Lanka are making a match out of this, aren't they. Second South African wicket and it is the big one of de Kock. He tries for a sweep, ball takes the glove, goes up in the air and Dickwella stands in his spot to take the easiest of catches. Jeffrey Vandersay had to leave the field with a bloodied left hand. He was going for a catch at third man, the ball fell just short and it looked like his finger took a beating from making that attempt. Never really got going. Three of their biggest partnerships all ended in the 30s. It will take a monumental rescue act from the bowlers for Sri Lanka to even put up a fight now. Twin-strike for Phehlukwayo! First, it was Perera, who went high but not long and Du Plessis took a staightforward catch. Then, he knocked over Dhananjaya de Silva. No hat-trick though, as the next ball was a dot. They have dragged themselves into the three-figure mark but Sri Lanka can still make a match out of this. Five overs are left and the explosive Thisara Perera is on strike. At the same time, though, the batsmen have to face a lot of Steyn and Rabada now. And the stumps are a-flying! Phehlukwayo has kicked up a storm of stumps and bails behind Angelo Perera. The powerplay overs were good for South Africa but Sri Lanka have done well to pull things back. Mendis and Perera have put up a 31-run stand for the fourth wicket. SL 39/2. Kamindu Mendis hit two consecutive sixes off Rabada in the fourth over and then back to back fours off Steyn in the fifth. Fernando has also been on the offensive so those early blows have been ironed out a bit. And Rabada gets a wicket for himself. Kusal Mendis simply lifts it straight to mid-on and he also walks for a duck. First runs on the board comes in style, Rabada pitches this one up and Avishka deposits straight back over the bowler's head. That is as good a shot as you'll get to see. Well that didn't take long, Dickwella drives, gets a thick edge on it and Miller has taken his first catch as South Africa's T20I wicketkeeper two balls into the match. Dale Steyn with the new ball in his hand, Niroshan Dickwella and Avishka Fernando walk into the middle. ....just like how there is still some time left for the IPL to start. But we have started rolling out the pre-tournament reads already. Ya, we are quick that way. You can hop over to this link which is a preview for CSK, this one is for Mumbai Indians and this one is for KKR. Not that we are ignoring the other teams but these are the ones we have for now. David Miller is the designated wicketkeeper, Quinton de Kock is playing though. After Sri Lanka pulled off the mother of all upsets by winning the Test series, South Africa ensured cricketing logic returns by bossing the ODIs. Now they would be looking to extend that run into the T20Is. Toss is about 10 minutes away, let's get right down to it.